As of November 2015 The Connection - Rhodes is progressing well. Currently all building slabs have been poured along with concrete columns and structural steel erected on two of the four buildings. 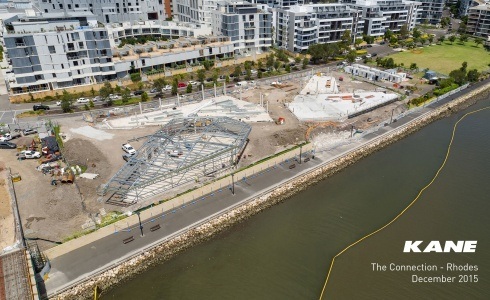 The team on the connection are looking forward to completing the structural elements of each building early 2016 and also commencing the wharf construction and road works early 2016. Take a look at the drone footage.